Does Your Company Need A CFO? Bookkeeping 101 Chief Financial Officer will help you determine if you need a CFO for your business. Many business owners fill a number of roles in their company: Chief Executive Officer, Operations Manager, Personnel Manager, Purchaser, Buyer, Controller and even Customer Service and Sales Manager! The list can be overwhelming and so can the job. But, at some point, the strategic owner realizes he or she must eliminate a number of the roles that have grown up around them and delegate the bookkeeping basics to capable people. And one of the most critical of these is the position of Chief Financial Officer, or the CFO. The CFO thinks and works through the lenses of both an entrepreneur and a manager. This typically means seeing the financial goals of the company as an entrepreneur would in terms of risk assessment and increasing profitability. But he also understands the necessity of systems, controls, and the need to manage the company finances effectively and properly. He works very closely with the CEO or business owner to analyze reports, check the cash flow, examine current trends, and set future financial strategy. Typical duties of a CFO include setting goals, objectives, and strategies for the financial management of the company. This will likely involve overseeing the activities of the accounting department, implementing proper auditing procedures and internal controls. Also, analyzing financial reports such as the income statement and balance sheet and making recommendations based on those reports to the CEO or business owner. Often, a good CFO will be advising upper management on how economic conditions or trends as well as long term liability may impact the business and be involved in supervising investment and loan activities. 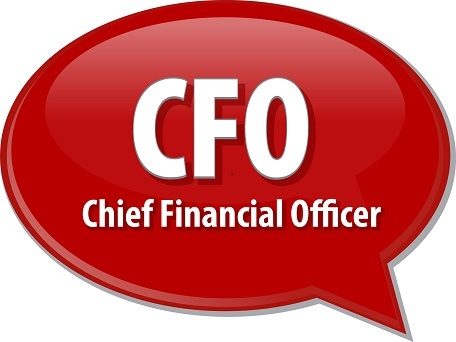 Bookkeeping 101 Chief Financial Officer - Does Your Business Need a CFO? Hiring a CFO can help take your business to another level of growth and make it possible for your company to have more profitability than ever before. But actually hiring a CFO is a big decision. As the business owner, you have probably overseen the financial aspects of your business since the beginning. Some business owners are hesitant to hire a CFO because they are concerned over the increased expense of paying for the additional “C-level” salary. But hiring a CFO at the right time can help you build the long-term success of your company. A good CFO will provide a level of expertise regarding the financial health and potential of your company that you are probably not capable of. Yet, by having someone competent in that role, it frees you up to do what you do best: build your business and chart the course towards your business vision. With a good CFO providing sound financial direction and understanding, you are better positioned to make well-informed decisions. While it may be difficult to hire a CFO too soon, it is far more likely to make the misstep of hiring one too late. For many small businesses, a full-time CFO may be an unnecessary luxury. But how can you know when it really is time? Here are five bookkeeping tips and indications that, together, can be instrumental in cluing you in that a new CFO may be in order. As a company’s revenue increases, it becomes much more beneficial to hire an experienced professional to help manage the financial operations. While a company with relatively low revenue cannot justify the expense of a CFO, a company that is earning revenue in the range of $5 million to $8 million annually will have financial management complex enough to warrant the addition of a CFO. Your company may not be at the $5 million level yet, but if the growth rate of your company is increasing substantially then it might be beneficial to hire a CFO sooner than later. For example, if your company’s growth is more than 20 to 25 percent each year, then you shouldn’t wait to bring on a CFO. A rough guideline for judging the level of operational complexity is having a partnership or business with more than 40 or 50 employees. At that stage you should probably hire a CFO. In addition to the operational and leadership burden this size of business represents for the CEO, there are many compliance rules and laws that must be considered when a company reaches 50 or more employees. A business with one product or one service is relatively easy to manage. However, adding multiple product lines or service offering can make everything far more complex. Cash flow, pricing, direct costs, distribution and delivery costs not only increase, but managing it all financially becomes far more complicated. If your company is adding more products or services to the mix, then you will certainly benefit from having a financial executive overseeing that part of your organization. For many business owners, this is the pinnacle of success. Being in a position to offer shares in your company through an initial public offering (IPO) can be exhilarating and frightening. Money and all the complexities of your business’s finances come to the forefront now. If you are thinking that your company may be on a path to go public, then a CFO can be very beneficial. Among other things, evaluating the financial metrics and audits are required if a company is interested in initial public offerings (IPOs). Perhaps the idea of hiring a full-time CFO still fills you with uncertainly. The expense involved threatens to outweigh the perceived benefits. Your Bookkeeping Basics instincts keep telling you “Soon, but not yet.” If that is the case, then you might consider the option of having access to a part-time financial professional instead. Outsourcing some or all of the needed function of a CFO is a viable alternative. A professional working on an “as-needed” basis can manage your current CFO needs allowing you to benefit from the services while saving money at the same time. When you reach the stage in your business where you may have to consider the services of a Financial Manager please do not hesitate to give Horne Financial Services a call. We would gladly help you to determine what level of financial skills you should be recruiting for. Stephanie Horne is an experienced bookkeeper and Enrolled Agent. She is the owner and founder of Horne Financial Services in Rohnert Park, California along with this website and has over 20 years of in person, virtual and outsourced bookkeeping/accounting and tax preparation experience with businesses of all sizes. Her love and passion is to work individually with business owners and families to help alleviate any financial stress or concerns by helping them to understand and have better control of their income, expenses, cash flow, and tax liabilities. She can be reached through her Horne Financial Services Facebook page as well.